I was awake at a reasonable time of 6am this is normal for me so happy with that. We had a really slow morning planned as we knew we were going to be up super late. 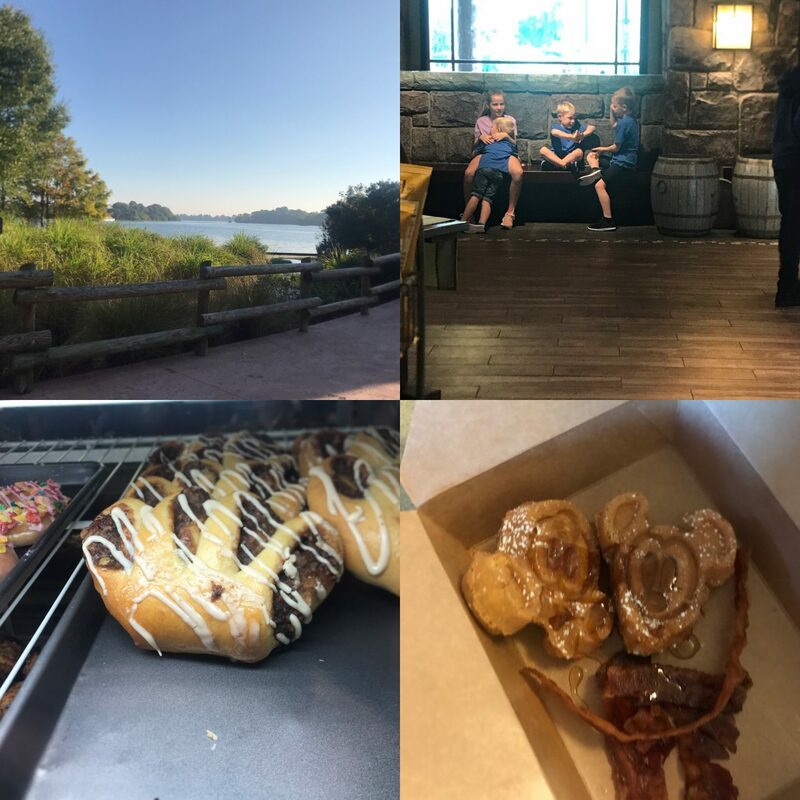 We popped to the Roaring Forks at our resort Wilderness Lodge and grabbed some breakfast to go. This was delicious. Breakfast is my favourite meal of the day and this didn’t disappoint kids all had waffles me and Adam had a breakfast platter. We promised the kids they could go in the pool for an hour so off we went. It was hot today and the pool was busy. This resort seems to have mostly American families. Lots of kids going down the slide Grace had a blast and went off on her own for a while. Back to the room and I needed to dye Graces hair blue as she was going as Evie out of the Descendants and she wanted her makeup done. This wasn’t as difficult as I thought it was going to be and personally think she looked great. We got the boat over to Magic Kingdom we hadn’t put any of their out fits on yet as it was just 1pm we was going for lunch at Crystal Palace. 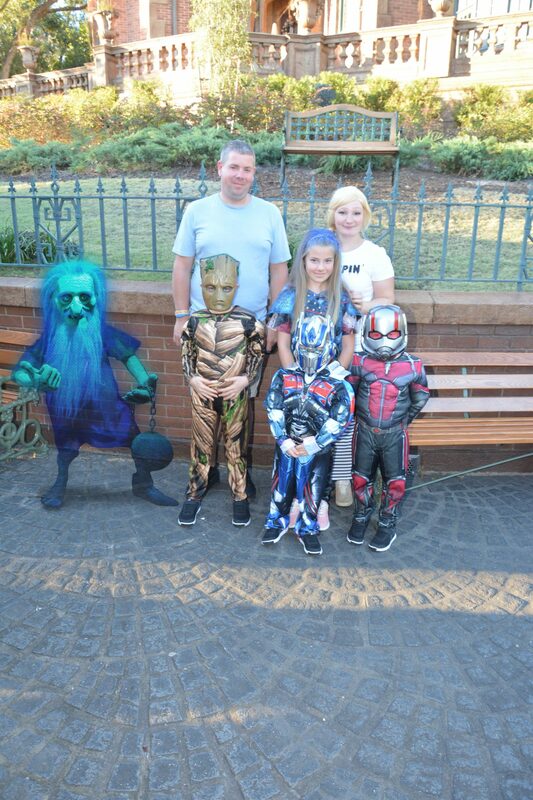 The park was already buzzing with excitement for the party and lots of people were dressed up, the kids love looking at all the characters. Crystal Palace was fab we love it here, checked in fast, our server was great and spent a long time talking to Adam about cameras as we had our GoPro Fusion 360 out on the table. Winnie the pooh was first shortly followed by piglet then they had a little parade and then we saw Eyore who is my fave. Elijah at this point went to high five him and punched him in the nose and then proceeded to be upset with his self and sulked on the window ledge. Eyore made Adam have a photo too which was funny. Tigger next but Elijah wouldn’t play he was still upset with himself I tried to hold him but he was having none of it. We had a good 20 mins to eat some more yummy food then pooh came back round. This was amazing as. He saw Elijah was sad and went and sat with him on the window sill. 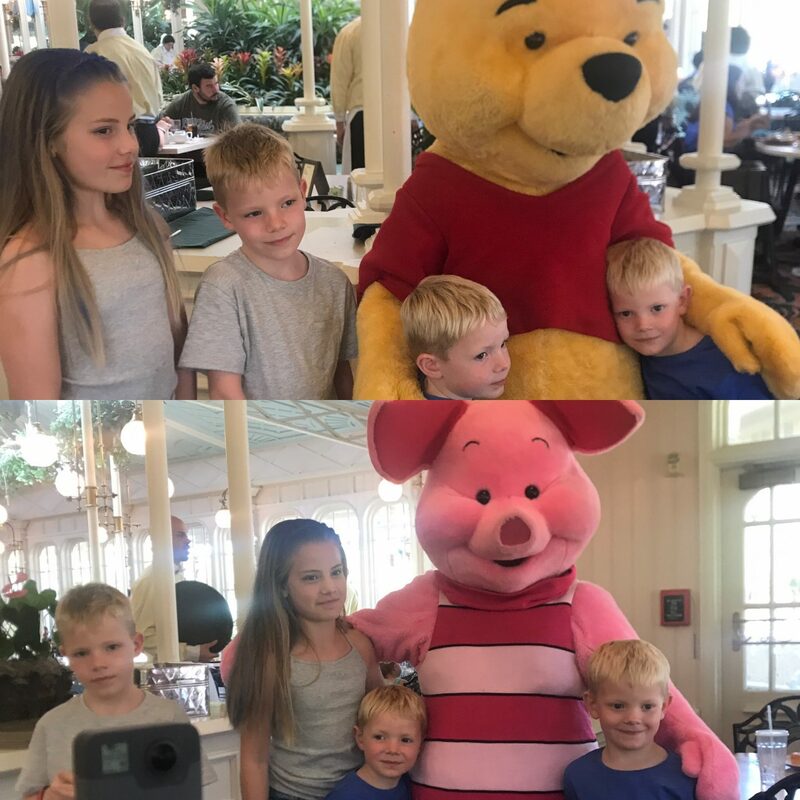 This cheered him up, they don’t talk but in his own way he had a little chat with him and 3 mins later Elijah was all smiles again love a little Disney magic. 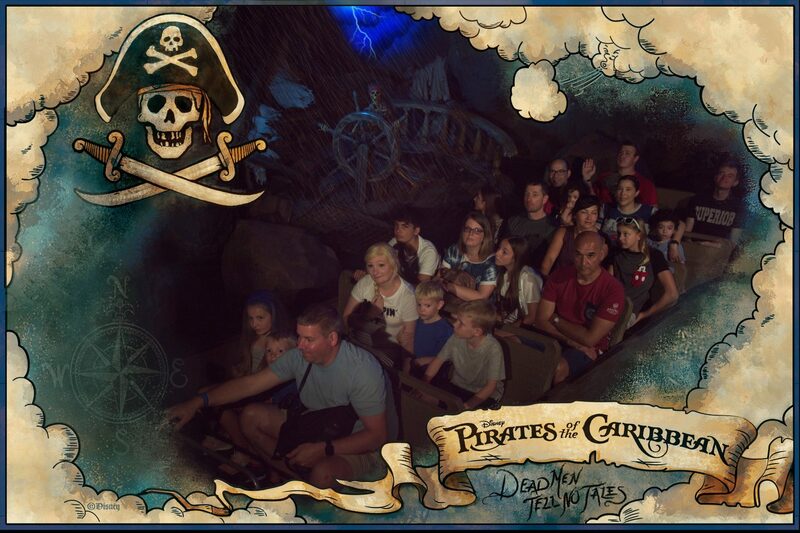 Once out we had a fast pass for Pirates. The kids didn’t remember this but loved it the boys love anything pirate lol then we saw a check in station so checked in for the party and got our bands treat bags and a map. We rode the carousel which is always fun. 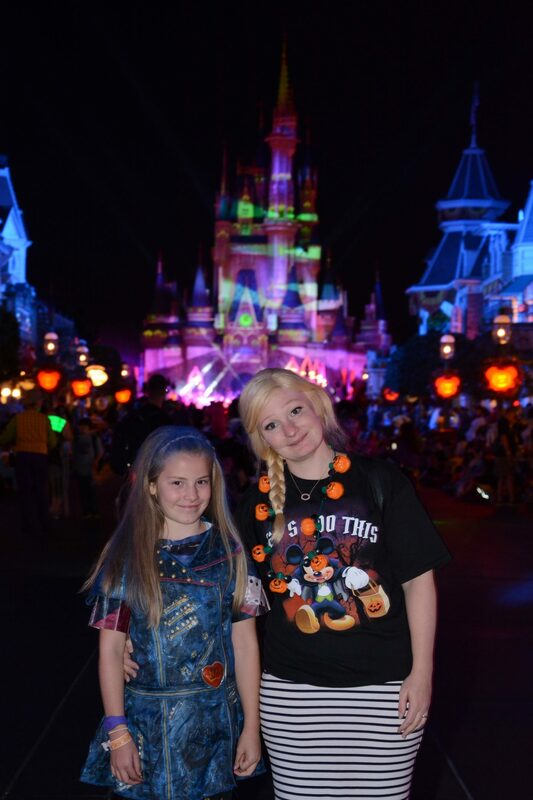 Then we did Peter pans flight (no idea why people que more than 10 mins for that) and got changed into our outfits. The kids looked fab and got a lot of attention lots of people recognised Grace which made her happy. We rode haunted mansion the fastpass for this was not fast and I don’t want to moan but there was a lot of ride access people on our turn so mobility scooters. And they couldn’t get everyone in the room fast enough so when it said no windows and no doors to get out of well the door was still open and people were still coming in. Not the fault of the people on the scooters but badly planned by staff. The ride then had to stop three times inside and we sat still for a long time. It was till good but not the proper experience. We got photos out side and the went back to the beginning of the park. 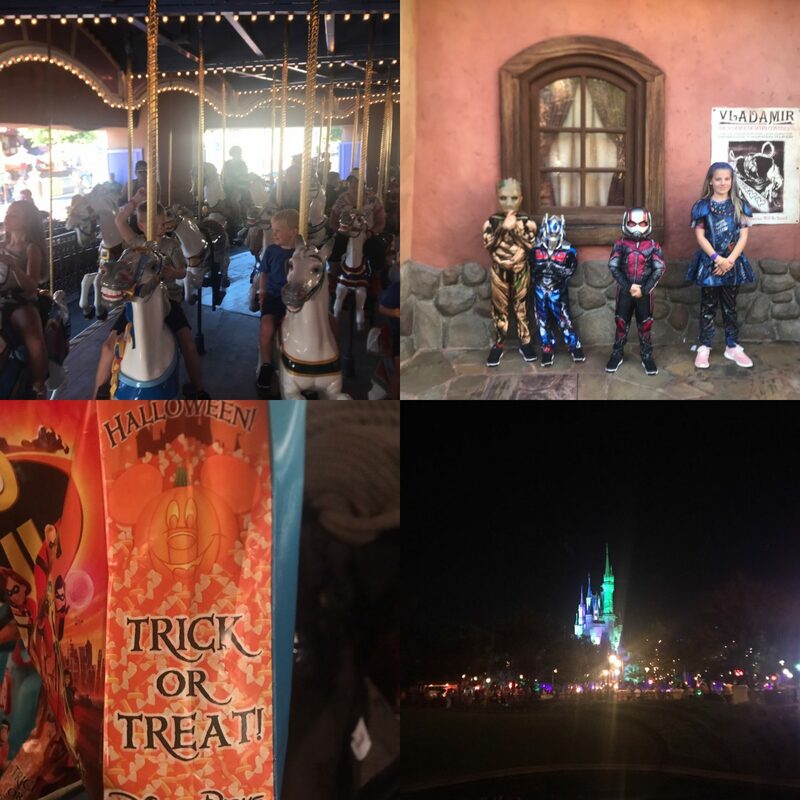 We did more treat stations and rode Goofys Barnstormer and Big Thunder mountain, the ride times were so low 5 mins. 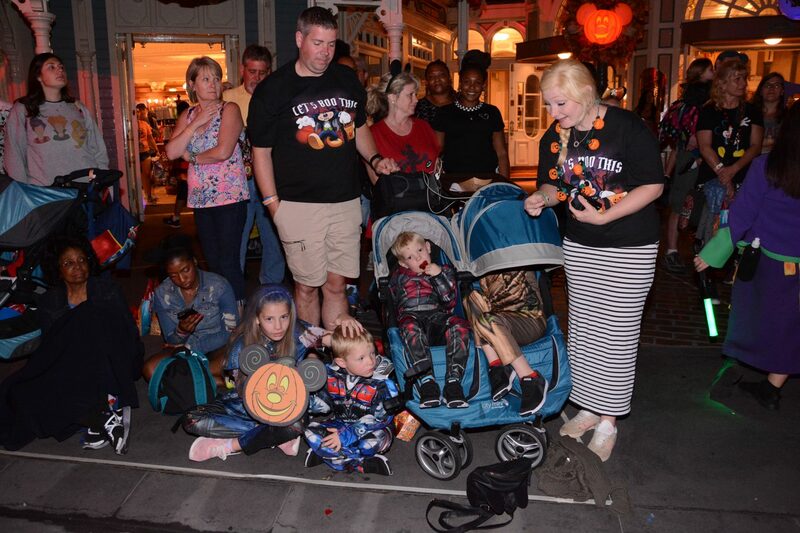 We purposely missed the first parade to do some rides and treat stations. Then we went back to Crystal Palace to stand by the railing to watch the fire works. This is one of the best places to stand not crowded and an amazing view. 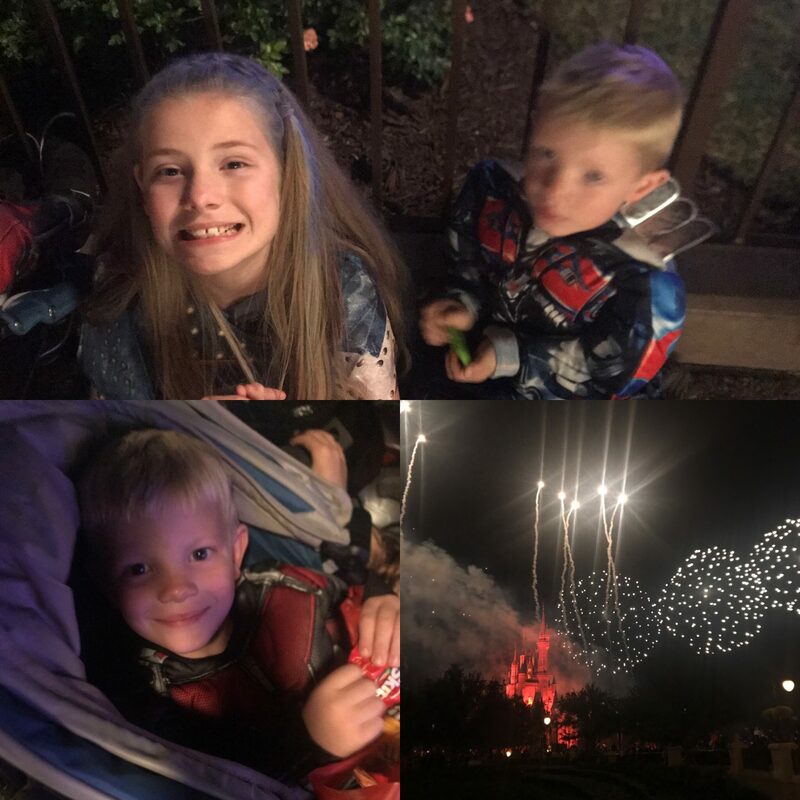 The fire works are just out of this world Seth loved them so much as did the others it was a special moment. Then we moved to Main Street to secure a spot for the parade we got the same spot we had last time just outside the shop by a walk way. The parade was amazing as always and all the kids were awake to see it. A very slow walk out which we didn’t mind and a quick boat journey home we were back in the room with a hyper Seth (remember he had a nap) at 1am. We would highly recommend the halloween party and when we come again we will definitely do it again.